I devoured this book in the span of a few days. I won’t soon forget it and I won’t let it slip out of my fingers, either. Some books you finish and pass on. This is one to hold onto. This is one to linger over. This is one to read again, to muse over her words. It is at once memoir, liturgy, story, and song. It is doctrine and it is poetry. It is the story of one life interrupted and rescued by the grace of God, it is the journey of grace intersecting all things, the piecing back together of broken pieces into a masterpiece. 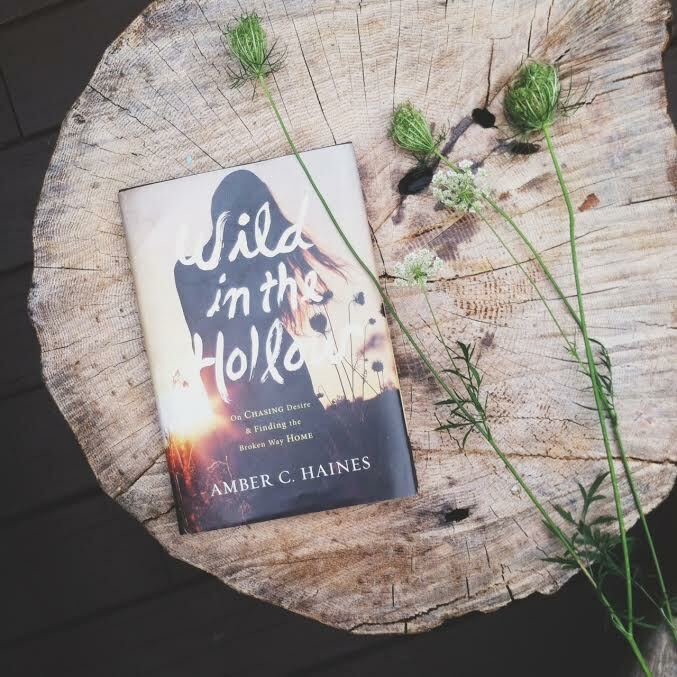 Amber Haines, with the voice of a poet and theologian, shares her story of “chasing desire + finding the broken way home.” How many of us cannot immediately find our place within those words? How many of us have not also run and found ourselves overtaken in the best way possible by the best love imaginable? She shares the journey: her marriage, the brokenness that threatened it. The children, the giving birth that almost brought death. The church, the exultant joy, the plunging despair. Abortion and affair, addiction and anxiety. The places Haiti and Tuscany both found in her heart, the odd juxtaposition, the beautiful juxtaposition. All the ways of finding home in a world where we are right to be homesick, where we see glimpses and shadows and hints of glory, but always find ourselves still somewhat out of sorts, still not yet home. And yet Home all along, because the kingdom is here. Already, but not yet fully. I admire Haines’ vulnerability and honesty as she shares her story, which is quite different from my own, and yet I find similar threads of discovery and understanding between us. I so greatly appreciate her courage in sharing her story, the rawness and rebellion, as well as the redemption. Some aspects of her theology were difficult for me to ascertain, especially in the beginning of her book when she came off a bit cynical + critical about the church and even seemed to call into question the role of the Scriptures. Her writing is peppered with Scripture, however, and it was helpful to read her book in its entirety to see the peace she makes with the Church and the healing she finds. You can see in Haines’ story the unfolding and unfurling of a soul as it is newborn, hungry for hind milk, tossed upon the bosom of the Church, entering wide-eyed and trusting, and finding over time the hypocrisy and hurt that the Church can engender. I bristled a bit at this because we live in such a church culture where believers are calling the role of the church and the necessity of the Scriptures into question. I would always err on the side of upholding the Scriptures and the role of the local organized church. However, I think Haines’ experience is not uncommon, and I think the way the Lord leads and guides her through seasons of wounding and healing in regard to the Church is good reading. If you hang in with her story, you will see her “grow up” in her relationship with the Church and find redemption even there. Many wrestle with what it looks like to be in a community of believers because it is so imperfect and difficult. Many will empathize with her words, and my hope would be that they, too, will come back to the centrality of the Scriptures and the church in God’s kingdom work. I love her words about the Kingdom maybe the best of all, probably because the concept of the Kingdom of God is what I have been studying and learning about all year. It is memoir primarily, not a theological treatise, and so I can appreciate the working out of her faith in the midst of a very real and messy life. The way we grow and change, the way we mature and heal and grow up more and more into the full stature of Christ as we walk with Him. I enjoyed her writing style, which is a more poetic style akin to Ann Voskamp’s. And I think many of us will find in her story our own stories of howling wild in the hollow places and finding the One who alone can fill the hollow. Here’ s a little book trailer, too! Thanks to Revell, a division of Baker Publishing Group, for a complimentary copy of this book in exchange for my honest review. All opinions expressed are my own. Well Martha you have me sold. Where can I get a copy!?!? And just to add, I’m pretty sure the next post I see should be about the release of YOUR book. You write about her writing as beautifully as she writes! You’re super sweet, AM! 🙂 You’re welcome to borrow my copy since you’re blood, or you can buy anywhere books are sold.